Convert DWF to PNG. DWF Converter, DWF to PNG Converter. AutoCAD Design Web Format to Portable Network Graphics Conversion. Easy CAD to Image Converter supports conversion from DWG, DXF, DWF to BMP, JPG, JPEG, GIF, TIFF, PNG, and TGA file types. Easy CAD to Image Converter is more than a file format converter, and you can even batch render your DWG, DXF, DWF drawing files to image files of any size to answer your specific needs, such as to facilitate the readers of your CAD drawings who have no AutoCAD-based software products installed on their computers; picture is easy for all. With Easy CAD to Image Converter, you can batch convert multiple drawing files to image files, select your preferred layout and layers for conversion, customize export area and line weight, specify output image height, width, DPI, and background color, grayscale output image files, load SHX fonts and XRef blocks if needed. 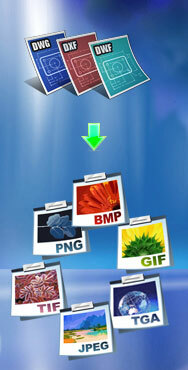 · Convert DXF, DWG, DWF drawings to such image format as BMP, JPG, JPEG, GIF, TIFF, PNG, TGA. · Batch conversion from multiple drawing files to image files. · Choose layout and layers for conversion. · Customize export area and line weight. · Specify output image height, width, DPI, and background color. · Load SHX fonts and XRef blocks if needed. Easy CAD to Image Converter is shareware, and you can evaluate it for up to 15 days. When the evaluation is over, you are opt to buy the full version of the software or remove it from your computer. The full version of Easy CAD to Image Converter software product can be obtained online after you pay the registration fee and get a license from one of our resellers worldwide. User Guide for Easy CAD to Image Web Version, Printer-Friendly Version, Interactive Version. · PNG (Portable Network Graphics) is a bitmapped image format that employs lossless data compression.